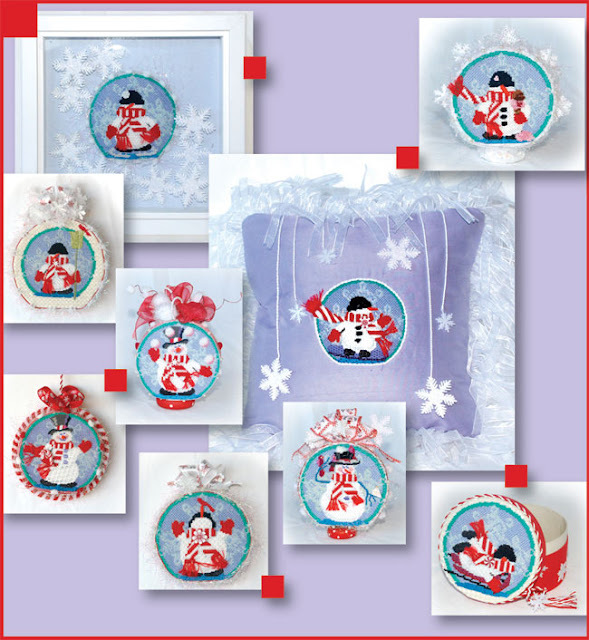 This fun loving group of 8 snowmen and 1 snowlady are sure to enchant your stitching hours this winter. Just like real snowflakes, no two are alike. All their little snowbodies are different. Too cute! Cynthia Thomas helped bring my vision to life on these little guys by writing the stitch guides. Each snowperson also has a special button embellishment — the perfect finishing touch to add character and style. As you can see, all the finishing is different. That’s where we really had fun. The finisher worked her magic and each one is unique. Finish yours as ornaments, snowglobes, boxes, framed, as pillows… The choices are endless. Back from the finisher, I just couldn’t wait to share these with you. As this is our brand new needlepoint club for 2009, the stitching fun doesn’t begin until March. Sign up early to make sure your canvas series is reserved. Happy New Year! I didn’t know about the flakes earlier. Since many of us are new, can you explain your club and are the flakes still available? click on needlepoint and then on needlepoint clubs. All clubs are still open! Hope you will join us.